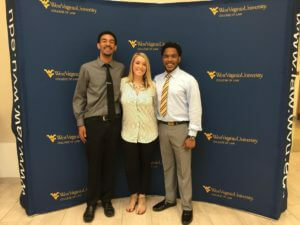 After graduating from University High School in Morgantown, Shaquann Shaw found himself in a situation similar to many other newly minted graduates. He was unsure. He didn’t know his next step or which direction life would take him. He knew he had to survive. He was thinking about college, but work seemed like the more feasible option. He was searching. Shaq thought he had no choice so he went to work. He tried a little bit of everything. He worked 3 or 4 different jobs. He hustled to find other work on the side doing manual labor. He found some stability working as a salesman at a shoe store, but he realized he wanted more and his life vision began to take shape. He knew he needed college to get to where he wanted to be. He set his sights on earning a degree in Business Administration with the vision of one day owning and operating his own funeral home and crematory. The transition to college didn’t go smoothly for Shaq. With working 8 hour shifts, he decided to attend a National Online University based off a brochure he stumbled upon leaving work. It sounded good to Shaq. They had a business program and he could study around his work obligations. What he didn’t anticipate was the lack of support. The college he chose struggled to meet his needs. Their technical department was unresponsive and unreliable. He started late due to technical issues and never caught up. He felt that he could never communicate with instructors and instead of going the extra mile to contact them he succumbed to frustration. “I ultimately just gave up,” he said. Shaq new he couldn’t go out without a fight, so he sought alternatives. He looked at West Virginia University, but was weary of such a large institution. Finally, the stars aligned and he found West Virginia Junior College in Morgantown. He requested information about the Business Administration program at WVJC and after being contacted by the Director of Admissions, Matt Hahn, he scheduled a college visit. At that first meeting, Shaq realized WVJC had a personal touch and the courses he needed to one day open his business. He figured versatile training in all aspects of business from management, to sales, to marketing and advertising would prepare him for his journey. He decided to give it a shot! It’s a decision that so far has paid great dividends for Shaq. He has excelled as a student in what he describes as, “a stress free environment of gratitude and support.” He works closely with Brittany Nuzzo, the Academic Dean, and applauds her effort to help him reach his goals. Now, Shaq can see the finish line. He not only has his business degree in sight, but he is also working toward a degree in Legal Office Assisting. His plans are to complete both programs and obtain an externship in a law office and eventually work as a paralegal. From there the goal is to combine the business and legal training and skills to one day open his Funeral Home armed with the knowledge and ability to ensure its success! Quite the story of progress for a young man who not long ago was unsure of where to turn and which direction life would take him. If you, like Shaquann are looking for a college with versatile training and a personal touch, request information today! For important information about the educational debt, earnings, and completion rates of students who attended the Business Administration program CLICK HERE and for the Legal Office Assisting program CLICK HERE.